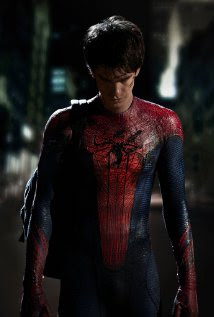 Well, it seems that 2012 isn't just the apocalypse - it's also the release of a new Spider Man movie. Forget about the last 3 movies this is a new Spider Man cast starring Andrew Garfield, who shared the 2007 London Theatre Critics Circle Most Promising Newcomer Award. He's also known for his performances in The Social Network, The Imaginarium of Dr. Parnassus and Never Let Me Go. Apparently Toby Maguire, star of the last 3 movies, got out of the Marvel's web. Also on the cast roster is Dennis Leary and Irrfan Khan as the Proto-Goblin. Emma Stone is replacing Bryce Dallas Howard as the romantic interest of Spider Man for this movie. We'll have to wait and see if all these cast changes will doom the franchise, ala "Batman", or if the new cast can improve on the already proven cash earning series. Also added to the series is 3D! Hopefully there won't be actors flying out of the rafters as in the Broadway adaptation. Stan Lee, founder of the Spider Man series known for his onscreen cameos might just make it into this movie after not being in the latest X-Men First Class. He was quoted via Twitter "Warriors mine, grieve thee not that I have no cameo in X-Men 1st Class. ‘Tis just that the movie was filmed too far away for me to attend"
Stan Lee's not in the new XMen?! WTF! That Broadway Spider Man is off the chain! Yeah, no Stan Lee is the new X-Men movie. The filming must have been far out there for Stan not to be able to get to it - He's waaay out there.